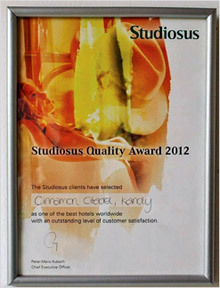 Cinnamon Citadel Kandy has been voted by the clients of Studiosus as one of the best hotels worldwide with an outstanding level of customer satisfaction and has won the title Studiosus Quality Award for the year 2012. Studiosus is Germany's leading tour operator that offers outbound guided tours to many countries worldwide. "The guest is the most important stakeholder of our business, winning this award means that the staff and management of Cinnamon Citadel Kandy have displayed an outstanding level of customer service resulting in a higher level of customer satisfaction", Sri Lankan Resorts Sector Head Jayantissa Kehelpannala. Located adjoining the country's longest river and in the hill capital of Sri Lanka, Cinnamon Citadel Kandy invites guests to experience absolute comfort offered at a Cinnamon Resort with a twist of modern chic elegance. Enjoy buffet style breakfast, lunch or dinner with a delectable selection of international and local cuisine at the 'Panaroma' main restaurant. Guests can choose to dine indoors or sit outside alfresco style, whether it's a sunbathed breakfast or dinner under the stars. Apart from the Studiosus Award, Cinnamon Citadel Kandy also boasts to have received the Trip Advisor Certificate of Excellence, ISO 14001 Certification, ISO 18001 Certification, ISO 22000 Certification.